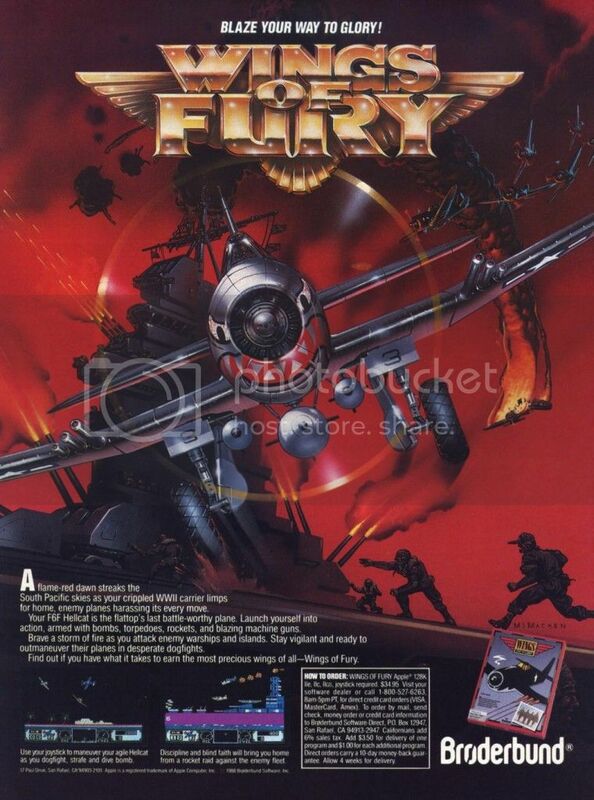 Wings of Fury came out for Apple computers in 1987 as a side-side scrolling action game set in 1944’s South Pacific during WW2. Published by Broderbund, players were tucked into a Hellcat as they flew off the deck of their carrier to engage enemy forces whether they were ships, island defenses, or other planes. It was an arcade game with a small dash of flight mechanics thrown in to make getting that high score just a tad more challenging. For one thing, you had to learn how to take off properly from your carrier by driving to the proper end and then revving up to launch yourself off from the other. Falling off of the ship while doing this was also part of that training, something I did a lot of when I played this on a friend’s computer. Starting the game, you could pick from a variety of difficulty levels based on military rank such as Lieutenant all the way up to Captain. After that, you picked what you wanted your Hellcat to carry: bombs, missiles, or even torpedoes. Then you got to see your plane rise up from the bowels of your carrier, the Wasp, and it was up to you to take off without splashing into the ocean. Did I forget to mention that you also had to know how to land in order to replenish your weapon load along with your fuel? You also had a limited number of lives. Fortunately, Wings of Fury took the arcade approach and allowed your Hellcat to carry crazy amounts of ordnance, such as thirty bombs or missiles, and guns had unlimited bullets. All of those extras came in handy when sweeping over an island to cleanse it of offending machine gun nests, anti-aircraft guns, huts, and soldiers running around on the ground. Flying around was relatively easy with the joystick. Going up and through the top of the screen zoomed everything out. Your plane would look like a pixelated dot with wings while a wider view of the play area showed you the islands, any ships, and whatever else was in range. It was really handy to be able to pretend to be a bomber at this altitude since the guns on the ground couldn’t hit you, but it also tested how well your bombing skills were. Wings was a fun game on the Apple and it would also be ported to the leading platforms of the day whether it was the Commodore 64, DOS, or the Amiga with enhanced graphics and soldiers screaming as you bombed them out. It would even come out on Nintendo’s Gameboy Color in 1999. There’s even a freeware remake for PCs. This ad which came out in 1988 for the Apple version has your Hellcat screaming off the page with a few screens of the relatively ugly graphics below. What was interesting is that the islands and enemy ships have little Rising Sun flags, but the documentation and the massive wall of text for the in-game introductory crawl make no mention of the Empire of Japan other than as “the enemy” leaving it to players to figure it out for themselves. Subversive learning technique to get people to crack open a history book? Or political correctedness going too far? Whatever the case might have been, Wings made WW2 arcade heroes out of everyone. Battles against flaming planes and menacing battleships look a lot more exciting in DOS or the Amiga, but it was still fun on the Apple! ← From the pages of the past! Ads of yesteryear – Pitfall! Great post and thanks for the heads up regarding the remake. I used to play this quite a lot on the Amiga….in fact, I think I’ve still got it around here somewhere. Chocks away!